TheRustedChain - The Blog: Me... in a magazine! If you follow me on facebook or twitter, you might have seen me mention this last week. 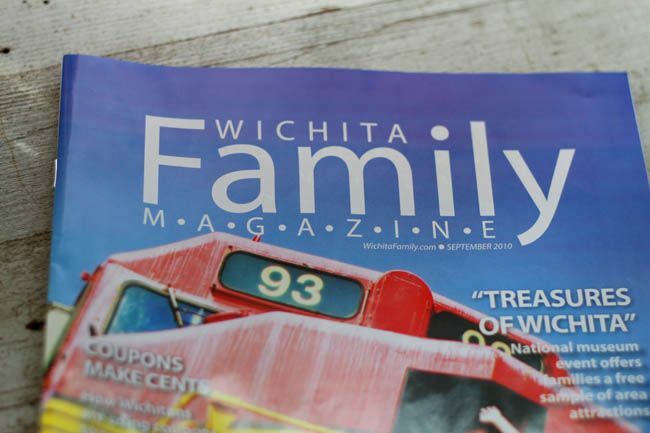 I was so flattered a while back when I was asked by Wichita Family Magazine if they could do a feature story on me. 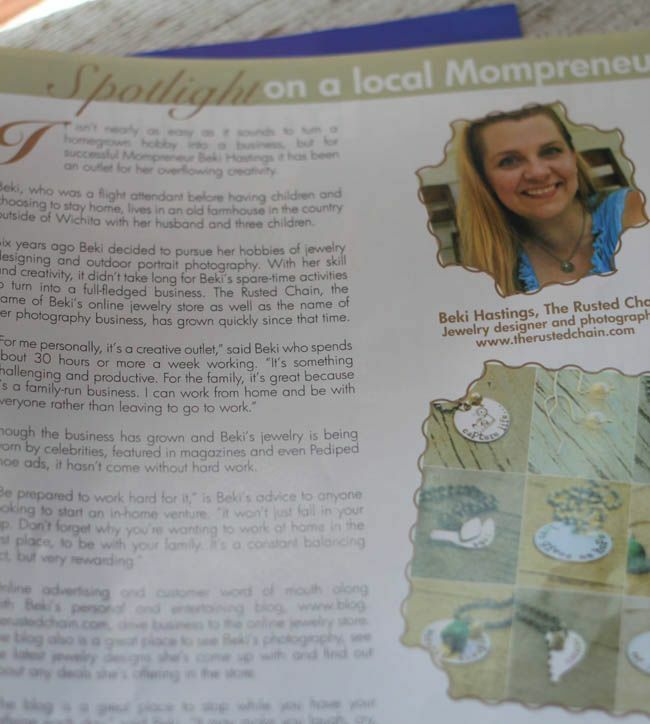 Lots of celebrities wear our jewelry, we've placed ads in magazines, and the business is growing daily. But to just feature me?! That's wild. And crazy. And cool. And very flattering. Click here to read the entire interview. There's even talk about the blog! That's how much I love you guys. Love you even more than my coffee. Maybe. Almost. Now, lest you start thinking I'm some kind of amazing mom who has it all together (and I know you were on the verge of thinking such things), just know that I forgot to bring my kids home from church yesterday. Didn't even know it until I got home. On a side note, what do you do when someone you know is harrassing you on your own blog? I'm pretty sure it's my ex-mother-in-law! Isn't that sad? What a great feature! You deserve it; your items are just beautiful! And how funny that you forgot your kids. I haven't done that yet but it'll happen, I'm sure. How awesome Beki!!! I am so happy for you!! That is hilarious about leaving your kids at church! Memories!!! you seriously crack me up! i you for that. congratulations on the feature. you and your fabulous business absolutely deserve it!! YOU LOOK FABULOUS in your article....CONGRATS!!!! my mommy left us at church when we were little. congratulations on the wichita mag publication. i know jessica lindsey; she was in MAPS at westlink and i adore her. That's awesome to be featured in a magazine! Congratulations! As for leaving your kids at church . . . well, sometimes I have to double-check to make sure I put the baby in the car. After I've already driven miles. I haven't forgotten her yet, but it's a little scary that I don't actually remember putting her into the car. Glad to hear the exciting news about the magazine article. What a great article! Congratulations on the feature!! That is fantastic! Congratulations on the feature! Too funny about forgetting about your kids! I can say a lot of things but most of all I thought...this is great...couldn't happen to a nicer person because it won't change her a bit! Then I came back and read what you wrote under the pictures and realized that I was right...you won't change a bit... and I'm thanking God for that! ah, that's cute - you're normal just like us! Just this last Sunday at church I was filling in the form to enroll my kids in sunday school for the next year and drew a complete blank on the line that said parents name. Congrats on the magazine! Uh, I had to laugh "At least they were in God's hands". I know a woman that once left her youngest at the grocery store. You rock! The story turned out so great! Thanks for your openness! Congratulations! The article looks fantastic! We don't care if you're not perfect, we love you anyway. I love you and couldn't be more proud!! Congrats on the magazine article. I read every word with tears in my eyes. umm... to all out there, she gets the "forgetting kids" thing honestly. The "mom" and I got home from church one sunday each of us thinking the other had picked up our little sleeping girl but, surpise, surprise neither had. So, we rushed back to church and there was our little one in all her blonde glory sleeping under the pew. Keep up the good work and may God continue to richly bless you and you family. Wow, on the magazine. good job, you and God. But the tender note from your daddy, ...brings tears. Such a gift a loving family is. You're doing a good job little momma. It's all worth it. Congrats ~ that's so exciting about the article. 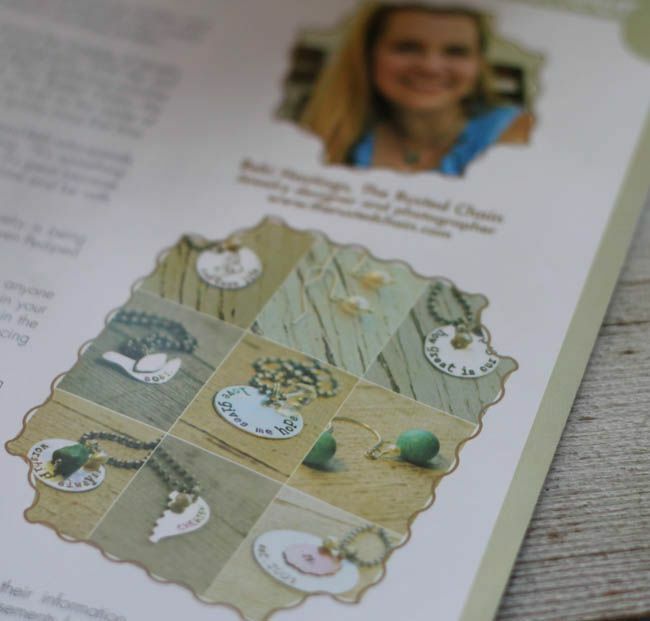 LOVE the collage picture of your jewelry and of course ~ the one of you is Fabulous! !